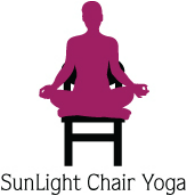 DVD's - SunLight Chair Yoga: yoga for everyone! ​*Available at the NYC Sivananda Yoga Center! ​Click here to order 1 DVD $7 (+ $2.95 shipping) in the USA. *Email your shipping address. Click here to order 2 DVD's in the USA (only $5/each) +$2.95 shipping USA orders.